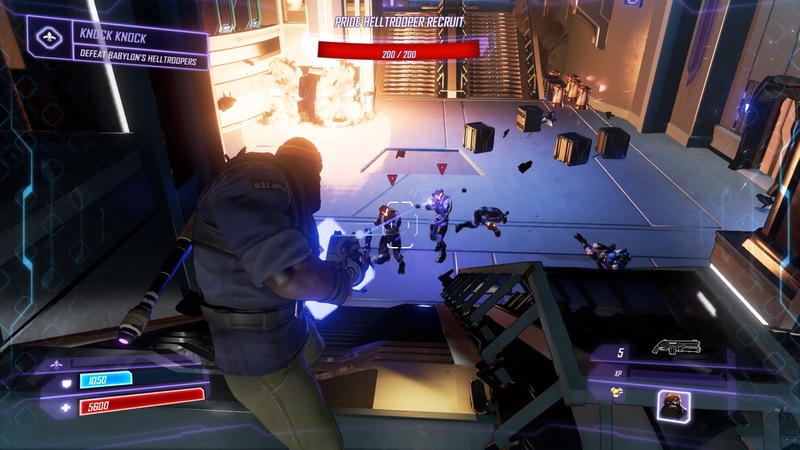 Agents of Mayhem has more in common with a MOBA than an open world crime game, and it was hard to play without feeling inspiration from the recent crop of hero shooters like Overwatch or Battleborn. Primarily, the difference is in the way the game actually plays. 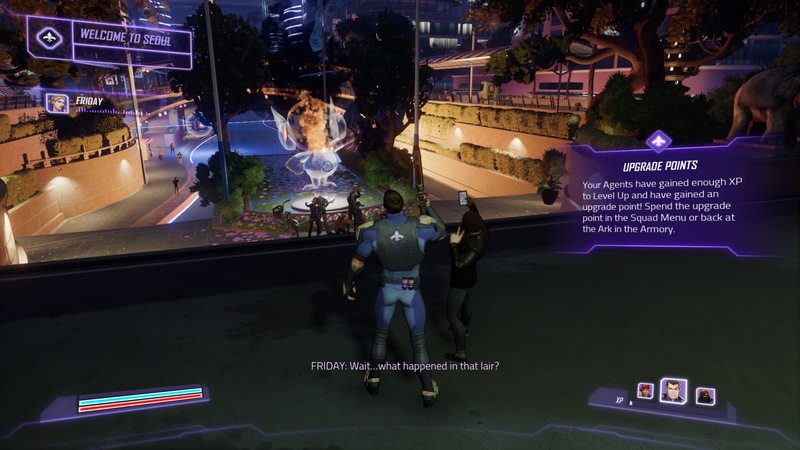 As described, Agents of Mayhem plays more like a MOBA than a shooter, with you controlling characters straight out of a Saturday morning television show, if it was okay for Saturday morning television to have curse words and collateral damage. The characterisation here is excellent, and surprisingly diverse — out of the first six characters I played as, only one was a white guy, and this meant that in terms of storyline there was a lot of different beats they could hit: one scientist from India was desperate to stop a plague that had ravaged her lands, while another is a Marine boot camp instructor that's in a relationship with the voice in your ear, who spends a significant chunk of time putting down some of her former trainees who are now working for the big bad guy. It says a lot of the game that when you stack the new characters up against returning favourites Johnny Gat — here a Korean supercop instead of a gangster — and Pierce Washington — still a gangster, here — they still come out positively. The characterisation is fun, and it means I actually rotated my team so I could get my favourite personalities on board, rather than those that was most effective. You'll want to choose carefully however, as each character has a passive ability, special ability and their 'Mayhem' ability, which functions like an ultimate. Ultimate abilities can change the game: Gat stands on the spot with two hand cannons and shoots everyone around him, Braddock can call down an orbital strike, and Hollywood makes everything around him explode, while he gets several stacks of empower to help him do more damage. 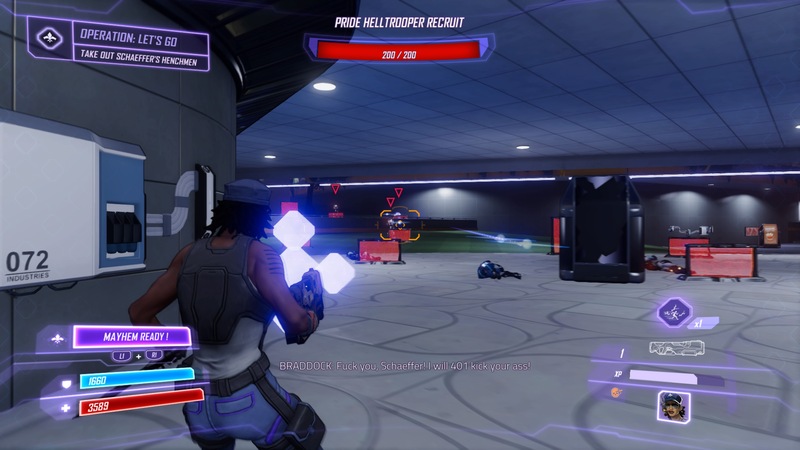 The status effects are a new addition, and feel out of place in a third-person shooter, but as you pump round after round into enemies, they also bleed figures, a spurt of numbers telling you how much damage was delivered with each round, bright and orange when the damage hits a weak spot. That's right, it's not about popping heads anymore, but hitting the weak spot for massive damage. Yes, yes — the weak spot is often still the head. In terms of tone, character work and even writing, I've got no complaints. This isn't going to win an award for storytelling, but it sets itself up to provide a lot of dumb fun, and it delivers, at least for a short while. The combat is a mix of shooting, melee and using your special abilities as they come off cooldown, with the occasional Mayhem move functioning to reset the screen. You control three characters at once from the roster of agents, switching between them by tapping left and right. This is useful because a character is locked to a specific weapon, and while a bow is useful for picking single targets off at range, but up close you might want to go for a shotgun or sub-machine gun. As you accrue experience and level up, you can put points in several different characteristics. These are unique for each agent, and they'll either benefit them or your entire team. This means that, even though I don't want to play with Johnny Gat and his close range shotgun, he stays on my A-team because of the extra 20% of damage he gives the entire squad. There's a little flex from the gadget system, which allows you to tweak characters abilities in a variety of different ways. It's flexible and easy to do, and changeable at any time, which can let you explore different archetypes for each hero. Here's the kicker though. Once you get used to the ebb and flow of the combat, it's dull. Mission design emphasises these flaws, with several tasks being near endless shootouts. Towards the end of several missions, it felt like a meat grinder, special abilities and particle effects popping off as the missions shudder to a halt. It's a shame because for the first few hours, the game totally had me wrapped up in the magic, until the crushing realisation that this is not a particularly good shooter, and it all feels flat. There was a horrifying moment, halfway through the game's story mode, when I was cleaning up loyalty missions. These missions shed more light on the characters you're controlling, which is great — remember, the game is well written and the tone is solid — it's just that I started to panic that certain missions might never end, not ever. There's still nice touches. 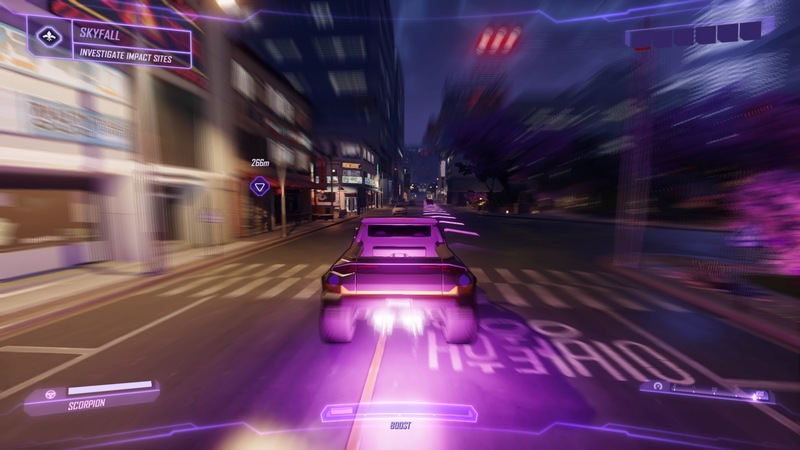 The game's open world improves the experience massively, with a unique vision of future Seoul, all neon signs and towering skyscrapers. Every character can triple jump and wall climb, and with the rooftops littered with objectives and collectibles, you're encouraged to explore the city. Driving isn't terrible too, although it lacks weight, and servers mostly as a way to get from A to B in the most stylish way possible. 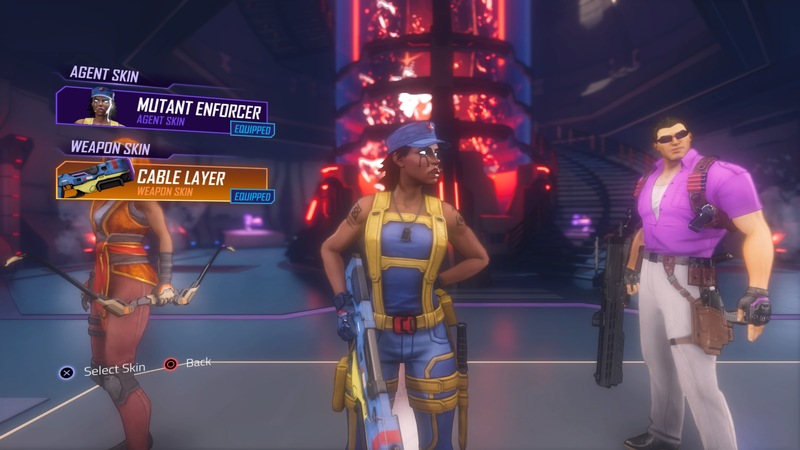 Agents of Mayhem is disappointing. This game fits into a niche — it's amusing enough to play just as a mindless blaster — but it's as deep as a puddle, and knowing you won't get a return for your time investment makes it hard to recommend.